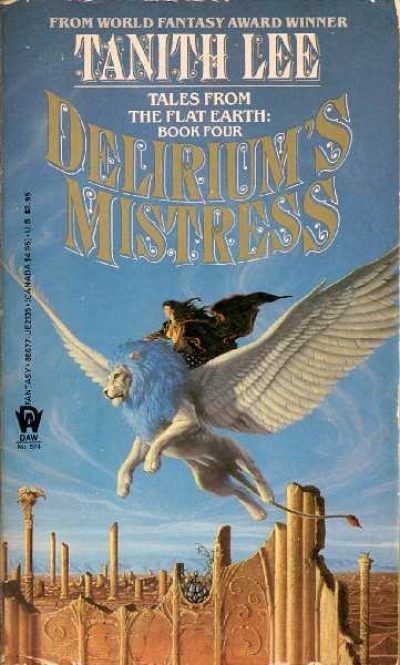 Tanith Lee’s 1986 Delirium’s Mistress is the fourth book in her Tales of the Flat Earth series. Although true love is alien to the demons who live beneath the Flat Earth, Azhrarn truly loved his Dunizel. She died, as mortals do. An enraged Lord of Darkness fixed the guilt on his brother Chuz, Master of Delusion, and vowed to even the score at some later date. Azhrarn has one tangible keepsake of Dunizel: their daughter, whom her mother named Sovaz. The girl’s demon father calls her Azhriaz. He does not love her as he did her mother; he sees her only as a possible playing piece in his games. He keeps her sequestered in his underground city until he finds a use for her. Of course, keeping your daughter hidden away in hell, concealed within a magical stone, surrounded by demonic guards, is basically begging some heroic adventurer to come retrieve her. A craven minion of the evil wizard Lak Hezoor, poet Oloru seems a poor bet to storm hell itself. And yet storm Underearth he does, finding his way past the guardians of the deeps with an almost inhuman ingenuity. A human would be mad to enrage the Lord of Shadows by stealing from him a treasure he did not value until it was gone. Oloru goes one step farther; he is Madness itself, in a borrowed form. Azhrarn cannot ignore this affront, which he believes to have been orchestrated by his brother Chuz. Nor will his daughter’s love for her rescuer convince the Lord of Shadows to reconcile with his brother demon. Only the possibility that outright war might break the world makes Azhrarn settle for less, for Contrapasso. And what of his daughter? Azhrarn has a purpose for her while she waits for her lover to serve out his term: she will be a living goddess on Earth, there to teach the mortals a bloody lesson about the indifference of the gods and the pointlessness of worship and religion. Azhrarn’s little game succeeds at something he never set out to achieve: he managed to discover the one affront the old gods won’t ignore…. I notice that while the first three books came out in quick succession, with a year or two between volumes, Delirium’s Mistress took another five years to appear. I have no idea if Lee had a trilogy in mind when she wrote 1978’s Night’s Master and first two sequels. Perhaps she planned a quartet and it just took her half a decade to work out how to finish it. Perhaps the third book, Delirium’s Master, was supposed to be the final work in a trilogy and then Lee had a better idea. While the previous books in the series— Night’s Master , Death’s Master and Delirium’s Master— could be read as standalone books, Delirium’s Mistress is explicitly a sequel to the other books, tying together threads from all three previous novels. Its strongest ties are to elements in Delirium’s Master. Mistress is also longer than the books to which it is a sequel (much longer than the first or the third). While I admit to a hint of plot fatigue during the Living Goddess section, I believe that the additional length was necessary. Lee needed a broad canvas to cover the ramifications of her various themes. I was somewhat surprised to see redemption and forgiveness prominently featured, but I suppose if one is immortal, one is eventually forced to come to some accommodation with those who have hurt you1. Anyway, good for Sovaz, Chuz, Azhrarn and other semidivine figures for growing as people. It’s just a shame about all the mortals whose lives were blighted by the pair along the way. Delirium’s Mistress can be purchased here. 1: Some people from a particular theatre group might be hoping I might take the lessons of this book to heart and set aside the events of Jan > April 2016. I would encourage those people to assume that’s exactly what I am going to do and entrust to me things that are precious to them.